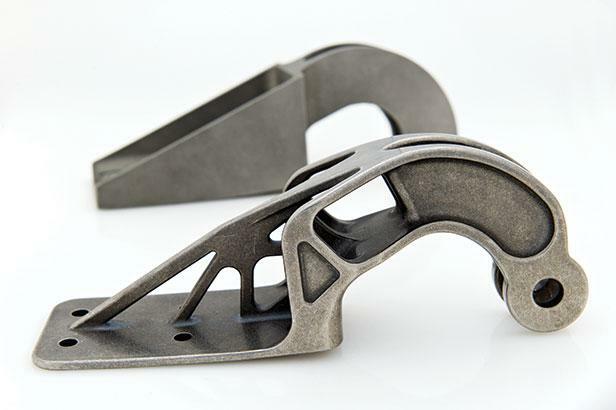 DMLS is a metal 3D printing technology that uses a laser to weld powdered metal together to create durable parts in complex geometries that are as strong as machined models. With real-world materials like stainless steel 316, titanium, Inconel, and aluminum, engineers can have end-use parts that can handle demanding applications. DMLS is best for parts that are too complex or expensive to machine, or where thermoplastics just won’t perform. DMLS uses a high powered laser to weld metal powders to a build platform to grow your part layer by layer. Parts must be heavily supported or able to build on themselves due to the extreme thermal stress of this process. DMLS can produce complex geometries not possible with other metal manufacturing technologies. Features such as internal cavities, undercuts, interlocking components, thin walls and conformal features are much easier to achieve with metal sintering than with traditional manufacturing methods. Because metal sintered parts are produced in the same production metals found in machining, parts produced with DMLS are suitable for end-use.